The beautiful hamlet of Cherry Grove is located 50 miles east from New York City on the Fire Island National Seashore, and a short 20 minute ferry ride from Sayville, Long Island. The moment you cross the Great South Bay, you leave all your city baggage behind... It is instant therapy. There is something here for everyone. All ages and needs. Cherry Grove, Fire Island offers one of the finest sand dune beaches on the East Coast. With the Atlantic Ocean on the south side of the island and restaurants and bars overlooking the Great South Bay and Long Island to the north. Residents and visitors to the Grove are always ready to have a gay old time and the community is well known for our themed events, cabaret acts, community theatre, and tea dances. Rich in history and charm, it has something for everyone. The Grove is easily accessible from NEW YORK CITY by boat, car or train. 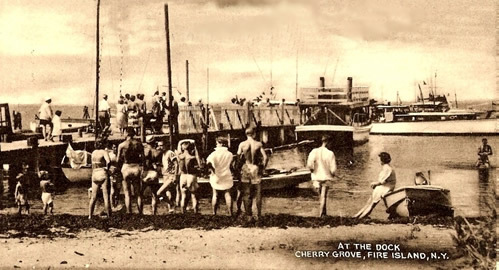 Did you know that A SUMMER PLACE REALTY'S office features the largest collection of HISTORICAL CHERRY GROVE PHOTOGRAPHS on display in Fire Island? And we added many more this summer! You are welcome to stop by to say hello and take a view of the unique history of Cherry Grove, Fire Island.